Note: if you haven’t read part one of this story, help me to help you by doing that first. I was raised to believe that if you don’t like the cards you’re dealt, then you do something about it. It sounds gritty, brave, and even vaguely American. Yet this approach to life brings its own liabilities, namely that you can’t always do something about it. Resistance can be a toxic response when acceptance is the way forward. 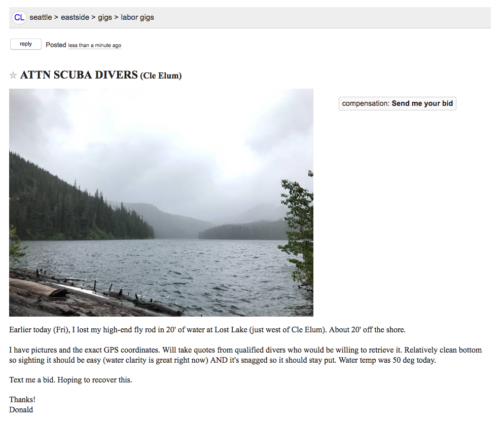 Within a few hours of my ad, the Craigslist responses began to trickle in. Their confident replies gave me hope, but I still had to land on a price. Emotions aside, I had to ask the sober question, “what is the specific dollar value of a recovery effort?” The next day I charted the lake topography, calculated distances, pulled wind pattern data, converted measurements…I wanted to have the best shot at a successful recovery. The fish-finder that day provided GPS coordinates and an approximate depth of 20-25′ where the rod went down. Though not terribly deep, it was far enough that I wouldn’t free dive it, mostly because my ears can’t handle water pressure after trying to impress a girl with a houseboat stunt years ago. I borrowed an outboard motor, battery, and fish-finder. The weather report showed bluebird skies; awful for fishing but perhaps ideal for underwater visibility and a fools errand to retrieve the irretrievable. I got connected to a friend of a friend with SCUBA experience, a guy named Willie. He was willing to help but didn’t have a boat. I had fortuitously already said yes to a separate outing with a new fishing buddy, Derald. The original plan was to hit a local river, but in light of the recent developments Derald offered to assist in the attempted recovery mission, and offered his framed raft. The mission was a go. On the second drive out, I became aware that I had enjoyed the freedoms of ‘passenger ignorance’ on my first visit and couldn’t remember the specific directions to retrace my steps back to the lake. Was it this gravel road or that one? That bridge looks familiar. At some point you just start making turns on gut instinct and hazy visual cues. With only one short detour we located the ramp. The wind had shifted and many of the massive waterborne trees were now scattered across open water, instead of jammed up against the shore. Derald and I would fish close to the ramp to kill time and wait on Willie. I heard the rumbling truck tires on gravel from a distance, through the trees and across the water. We anchored at the ramp and watched Willie suit up. Not only was he happy to attempt this crazy mission, he was a lot more optimistic than the guys at the dive shop. “I brought these mini-SCUBA tanks. They are a lot easier to work with”, he assured through teeth grinning ear to ear. Willie climbed aboard our raft along with his mini-SCUBA setup. He explained that this whole thing should be a piece of cake, we were minutes away from success. At this point, I really like Willie. 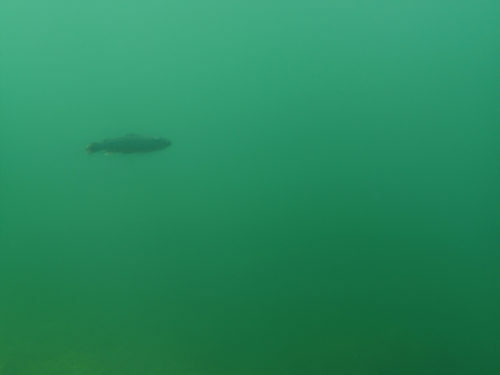 As we arrive at the coordinates, we discussed a broad strategy and he flops himself overboard into the 49º water. Immediately, Derald and I on the surface could see that something was wrong. Willie’s flippers and legs were flailing around above the surface for 10 seconds, then 20 seconds, then 30 seconds. Resembling something between a National Geographic predator attack and a kid’s swim lesson, the chaotic splashing confirmed something was awry. “I don’t think he has enough weight”, Derald murmured. Shortly thereafter, Willie popped right-side-up and removed his mask. He exhaled deeply, water droplets arcing out of his mouth and back into the lake. “I might need more weight”, Willie announced. 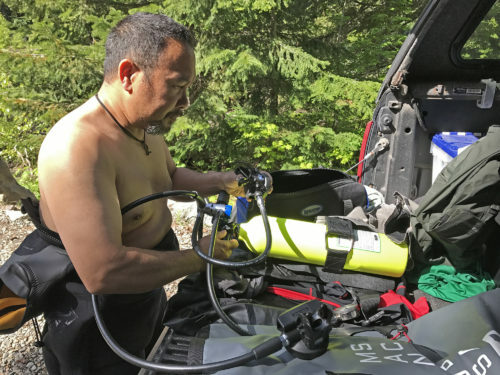 The price of portability with the mini-SCUBA setup was not only less oxygen, but less weight. Willie scrambled once more and finally got subsurface, beginning a few shallow sweeps. “It’s ok, he wasn’t down far enough”, I thought to myself. Another pass, this time further from shore. Willie alerted us that he was down from an initial 2000 psi of oxygen to 400 psi. This is the moment my optimism hopped overboard and joined my flyrod at the bottom of the lake. We had time for one last pass and I knew it had to count. We discussed a specific plan of intersection, given that the rod was dropped while traveling parallel to the shore. This attempt would be the nail in the coffin or the stuff that gets told at parties for a long time to come. It felt impossible and perfectly reasonable all at the same time. Mission successful. 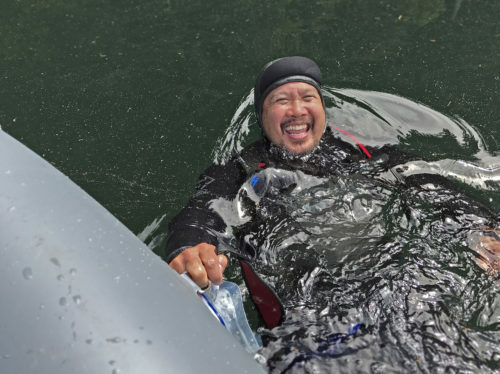 With smiles all around, we taxied Willie back to his truck, fished a bit, and started disassembling the raft to make the haul home. 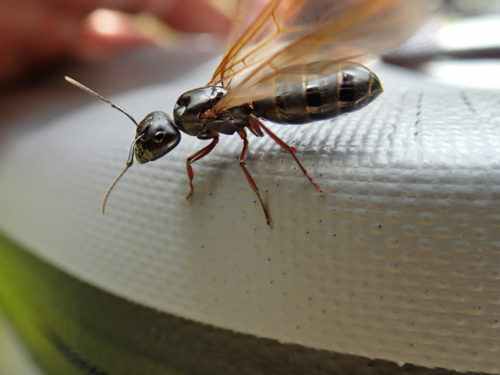 As we packed up our gear, massive carpenter ants started descending from the trees in huge numbers. For three seconds I thought about grabbing a rod and reel and trying some ant-looking patterns, but I could sense that now was the time to call it. We won. Time to go home, celebrate an “impossible” retrieval, and maybe swing by the dive shop to tell the guys to kick rocks. 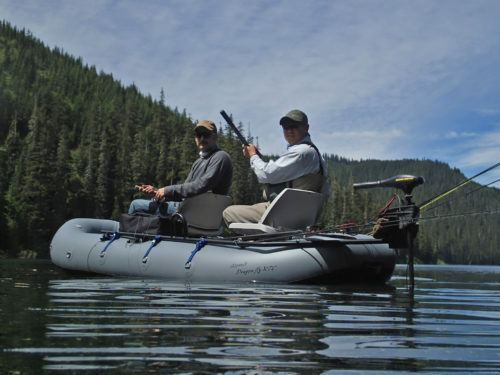 This entry was posted in catch and release, fly fishing, pacific northwest, rainbow trout. Bookmark the permalink.